First things first. The Hannah Montana show is hands down one of the worst programs on television. I've seen three or four episodes and they are borderline unwatchable. They work much like a train wreck does, in that you stare at it, mouth agape, shocked at the catastrophe unfolding before you. It truly is awful. But guess what? Hannah Montana: The Movie is actually pretty good. Whaddya know? The movie follows a young girl who leads a double life, one as a normal teenage girl named Miley, her actual persona, and one as a pop music sensation named Hannah Montana, her alter ego. After an embarrassing newspaper story, her father, played by Miley's real life father, Billy Ray Cyrus, flies her out to Tennessee and refuses to let her be Hannah. He wants her to be herself for a while to see if she really knows what she wants. She meets a young stud named Travis, played by Lucas Till, and begins to realize that a simple life may not be so bad after all. By the end, she'll have to make a decision (sort of): normalcy or stardom? There are a number of reasons why the Hannah Montana television show is so dreadful and I'm afraid I'd overload the Internet if I were to produce such a long list, but the number one reason is the acting. It's so phony, so incredibly over the top that it's shocking to think that people above a sixth grade IQ level actually enjoy it. The jokes and antics that are pulled are so mind numbing that they could very well induce you into a coma. Unfortunately, the film sometimes resorted to this style and it didn't always work. However, it's smartly more downplayed. The over the top in this film is like a Shakespearean tragedy compared to the over the top in the show. 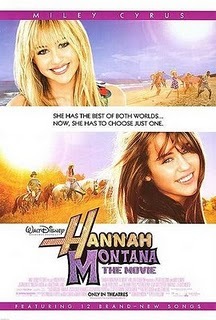 Hannah Montana: The Movie isn't astoundingly original. The story is old hat, the jokes are overused (oh, an animal in the pants--how refreshing), but it's charming and likable, despite some cheesiness as the film wrapped up. The actors stray away from their annoying TV personalities and create what could essentially have been completely new characters. Miley Cyrus, although not perfect, showed some real acting chops in her more emotional scenes and her love interest, Lucas Till, was charming and charismatic, creating a great onscreen couple that completely took me by surprise. Just as well, the movie was directed fantasically. It sported some beautiful shots and the director, Peter Chelsom, worked wonders with the actors. Taking a miserably unfunny group of characters from a piss poor television program and making them pleasant enough to sustain a feature length film is a miracle in its own right and I tip my hat to him. Hannah Montana: The Movie could have been a two hour long music video and indeed, it sometimes felt like the movie was primarily being used to promote the music, which is easy to note considering that the movie poster says, "Featuring 12 Brand New Songs" right at the bottom, but it never sank that low. The songs were undeniably catchy and some even fit into the progression of the story. It was impressive, to say the least. I do have minor quibbles with the movie, like an incredibly unfunny fight between Hannah and Tyra Banks and some eye rolling lines of dialogue ("Life's a climb, but the view's great"), but those are little divots in an otherwise smooth flick. Unfortunately, those little divots add up to form a huge gaping hole, which is essentially why my score is as low as it is. Still, the film is harmless and it was nice to see a movie for the kids that didn't feature some kind of obscene innuendo for the adults. Hannah Montana: The Movie is the biggest surprise so far this year. I can't believe I'm saying this, but consider this my recommendation. 3/5... nice haha. "Life's a climb, but the view's great", i could totally see myself as like a 7th grader liking that quote. i bet this is a good one to watch when it comes on tv and you're bored. I can't believe I want to see this, but I do... I'll wait until it hits University Mall.